The Statement of Cash Flows (also referred to as the cash flow statementCash Flow Statement​A Cash Flow Statement (officially called the Statement of Cash Flows) contains information on how much cash a company has generated and used during a given period. It contains 3 sections: cash from operations, cash from investing and cash from financing.) is one of the three key financial statements Three Financial StatementsThe three financial statements are the income statement, the balance sheet, and the statement of cash flows. These three core statements are intricately linked to each other and this guide will explain how they all fit together. By following the steps below you'll be able to connect the three statements on your own.that reports the cash generated and spent during a specific period of time (i.e., a month, quarter, or year). The statement of cash flows acts as a bridge between the income statementIncome StatementThe Income Statement (or Statement of Profit and Loss) shows performance from operations of a business. The financial statement begins with revenues and and balance sheetBalance SheetThe balance sheet is one of the three fundamental financial statements. These statements are key to both financial modeling and accounting. The balance sheet displays the company’s total assets, and how these assets are financed, through either debt or equity. Assets = Liabilities + Equity by showing how money moved in and out of the business. Operating Activities: The principal revenue-generating activities of an organization and other activities that are not investing or financing; any cash flows from current assetsFinancial AssetsFinancial assets refer to assets that arise from contractual agreements on future cash flows or from owning equity instruments of another entity. Financial instruments refer to any contract that gives rise to a financial asset to one entity and a financial liability or equity instrument to another entity and current liabilitiesCurrent LiabilitiesCurrent liabilities are financial obligations of a business entity that are due and payable within a year. A company shows these on the balance sheet. A liability occurs when a company has undergone a transaction that has generated an expectation for a future outflow of cash or other economic resources. Image from CFI’s Financial Analysis Fundamentals Course. Cash Equivalents: Cash equivalentsCash EquivalentsCash and cash equivalents are the most liquid of all assets on the balance sheet. Cash equivalents include money market securities, Bankers Acceptances, Treasury bills, commercial paper, and other money market instruments. include cash held as bank deposits, short-term investments, and any very easily cash-convertible assets – includes overdrafts and cash equivalents with short-term maturities (less than three months). Operating activities are the principal revenue-producing activities of the entity. Cash Flow from OperationsCash Flow from OperationsCash Flow from Operations is the section of a company’s cash flow statement that represents the amount of cash a company generates (or consumes) from typically include the cash flows associated with sales, purchases, and other expenses. 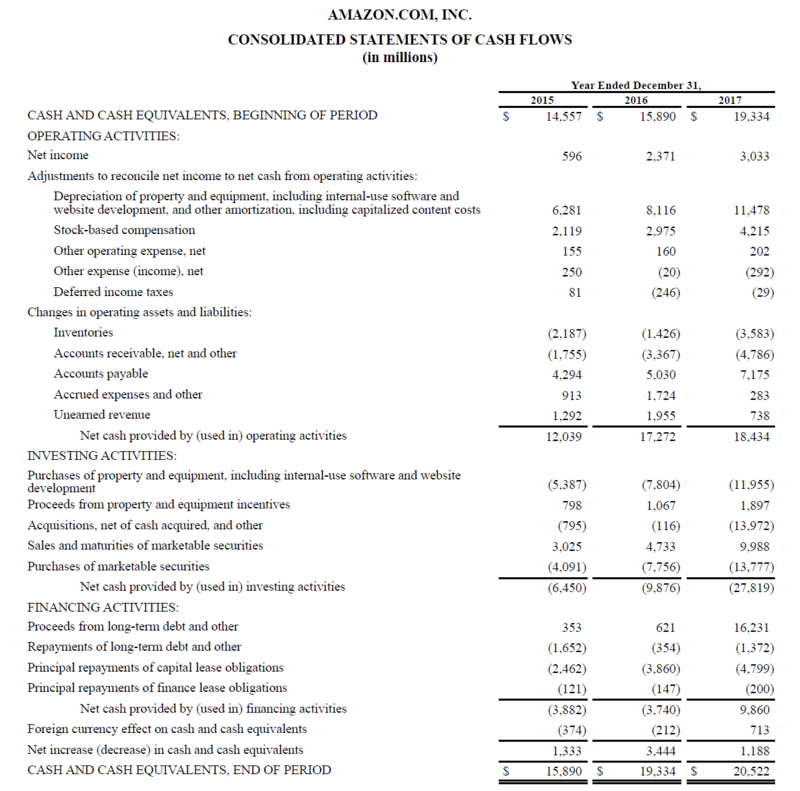 Direct Presentation: Operating cash flows are presented as a list of cash flows; cash in from sales, cash out for capital expendituresCapital ExpendituresCapital expenditures refer to funds that are used by a company for the purchase, improvement, or maintenance of long-term assets to improve the efficiency, etc. Simple but rarely used method, as the indirect presentation is more common. Depreciation expenseDepreciation ExpenseDepreciation expense is used to reduce the value of plant, property, and equipment to match its use, and wear and tear over time. Depreciation expense is used to better match the expense of a long-term asset to the revenue it generates. reduces profit but does not impact cash flow (it is a non-cash expenseNon Cash ExpensesNon cash expenses appear on an income statement because accounting principles require them to be recorded despite not actually being paid for with cash. The most common example of a non cash expense is depreciation, where the cost of an asset is spread out over time). Hence, it is added back. Similarly, if the starting point profit is above interest and tax in the income statement, then interest and tax cash flows will need to be deducted if they are to be treated as operating cash flows. There is no specific guidance on which the profit amount should be used in the reconciliation. Different companies use operating profit, profit before tax, profit after tax, or net incomeNet IncomeNet Income is a key line item, not only in the income statement, but in all three core financial statements. 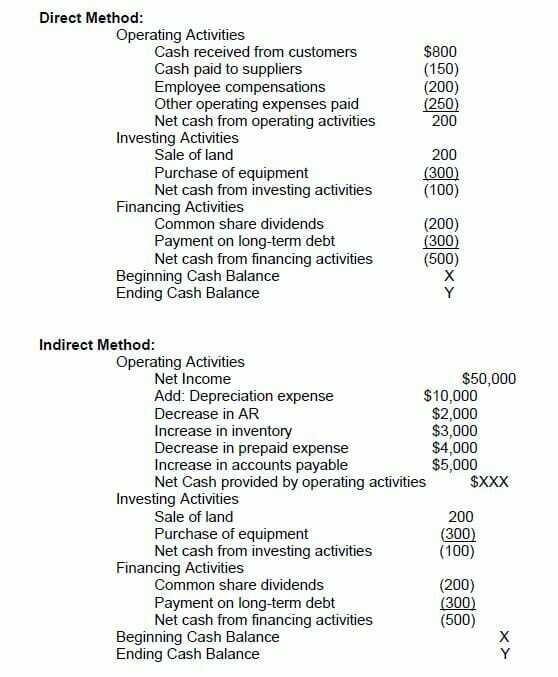 While it is arrived at through the income statement, the net profit is also used in both the balance sheet and the cash flow statement.. Clearly, the exact starting point for the reconciliation will determine the exact adjustments made to get down to an operating cash flow number. 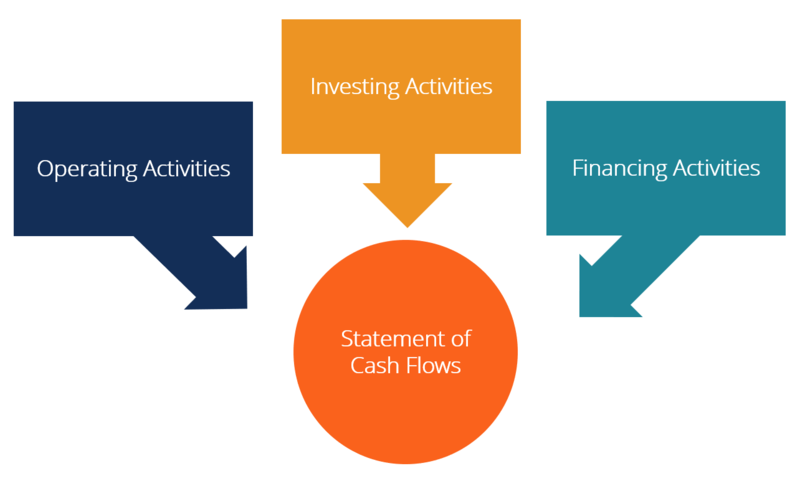 Cash Flow from Investing ActivitiesCash Flow from Investing ActivitiesCash Flow from Investing Activities is the section of a company's cash flow statement that displays how much money has been used in (or generated from) making investments in a specific time period. Investing activities include purchases of long-term assets, acquisitions of businesses, and investments in marketable securities includes the acquisition and disposal of non-current assets and other investments not included in cash equivalents. Investing cash flows typically include the cash flows associated with buying or selling property, plant, and equipment (PP&E)PP&E (Property, Plant and Equipment)PP&E (Property, Plant, and Equipment) is one of the core non-current assets found on the balance sheet. PP&E is impacted by Capex, Depreciation and Acquisitions/Dispositions of fixed assets. These assets play a key part in the financial planning and analysis of a company’s operations and future expenditures, other non-current assets, and other financial assets. Cash spent on purchasing PP&E is called capital expenditures (or CapExHow to Calculate CapEx - FormulaThis guide shows how to calculate CapEx by deriving the CapEx formula from the income statement and balance sheet for use in financial modeling and analysis. To calculate capital expenditures, use depreciation on the income statement, add current period PP&E and subtract prior period PP&E for short). Cash Flow from Financing ActivitiesCash Flow from Financing ActivitiesCash Flow from Financing Activities is the net amount of funding a company generates in a given time period, used to finance its business. Finance activities include the issuance and repayment of equity, payment of dividends, issuance and repayment of debt and capital lease obligations are activities that result in changes in the size and composition of the equity capital or borrowings of the entity. Financing cash flows typically include cash flows associated with borrowing and repaying bank loans, and issuing and buying back shares. The payment of a dividendDividend Per Share (DPS)Dividend per share is the total amount of dividend attributed to each share outstanding. The formula is total dividends / shares outstanding or earnings per share x dividend payout ratio. Calculating the DPS allows an investor to determine how much income from the company is also treated as a financing cash flow. Learn how to analyze a statement of cash flow in CFI’s Financial Analysis Fundamentals Course. Below is an example from Amazon’s 2017 annual report, which breaks down the cash flow generated from operations, investing, and financing activities. Learn how to analyze Amazon’s consolidated statement of cash flows in CFI’s Amazon Advanced Financial Modeling Course. Image: Course in CFI’s Financial Analyst Training ProgramFMVA™ CertificationThe Financial Modeling & Valueation Analyst (FMVA)™ accreditation is a global standard for financial analysts that covers finance, accounting, financial modeling, valuation, budgeting, forecasting, presentations, and strategy. . Under IFRS, there are two ways of presenting interest expenseInterest ExpenseInterest expense arises out of a company that finances through debt or capital leases. Interest is found in the income statement, but can also be calculated through the debt schedule. The schedule should outline all the major pieces of debt a company has on its balance sheet, and calculate interest by multiplying the in the cash flow statement. Many companies present both the interest received and interest paid as operating cash flows. Others treat interest received as investing cash flow and interest paid as a financing cash flow. The method used is the choice of the finance director. Under U.S. GAAPGAAPGAAP, or Generally Accepted Accounting Principles, is a commonly recognized set of rules and procedures designed to govern corporate accounting and financial reporting. GAAP is a comprehensive set of accounting practices that were developed jointly by the Financial Accounting Standards Board (FASB) and the, interest paid and received are always treated as operating cash flows. Investment bankersWhat do Investment Bankers do?What do Investment Bankers do? Investment bankers can work 100 hours a week performing research, financial modeling & building presentations. Although it features some of the most coveted and financially rewarding positions in the banking industry, investment banking is also one of the most challenging and difficult career paths, Guide to IB and finance professionals use different cash flow measures for different purposes. Free cash flowFree Cash Flow (FCF)Free Cash Flow (FCF) measures a company’s ability to produce what investors care most about: cash that's available be distributed in a discretionary way is a common measure used typically for DCF valuationDCF Model Training Free GuideA DCF model is a specific type of financial model used to value a business. DCF stands for Discounted Cash Flow, so the model is simply a forecast of a company’s unlevered free cash flow discounted back to today’s value. This free DCF model training guide will teach you the basics, step by step with examples and images. However, free cash flow has no definitive definition and can be calculated and used in different ways. Learn more, in CFI’s Ultimate Cash Flow GuideValuationFree valuation guides to learn the most important concepts at your own pace. These articles will teach you business valuation best practices and how to value a company using comparable company analysis, discounted cash flow (DCF) modeling, and precedent transactions, as used in investment banking, equity research,. How to Prepare a Statement of Cash Flows? The operating section of the statement of cash flows can be shown through either the direct method or the indirect method. For either method, the investing and financing sections are identical; the only difference is in the operating section. The direct method is a method that shows the major classes of gross cash receipts and gross cash payments. The indirect method, on the other hand, starts with the net income and adjusts the profit/loss by the effects of the transactions. In the end, cash flows from the operating section will give the same result whether under the direct or indirect approach, however, the presentation will differ. The International Accounting Standards Board (IASB) favors the direct method of reporting because it provides more useful information that the indirect method. However, it is believed that greater than 90% of companies use the indirect method. There are two methods of producing a statement of cash flows, the direct method, and the indirect method. In the direct method, all individual instances of cash that is received or paid out are tallied up and the total is the resulting cash flow. In the indirect method, the accounting line items such as net income, depreciation, etc. are used to arrive at cash flow. In financial modelingWhat is Financial ModelingFinancial modeling is performed in Excel to forecast a company's financial performance. Overview of what is financial modeling, how & why to build a model. A 3 statement model links income statement, balance sheet, and cash flow statement. More advanced types of financial models are built for valuation, plannnig, and, the cash flow statement is always produced via the indirect method. Below is a comparison of the direct method vs the indirect method. This statement is useful to investors because, under the notion that cash is king, it allows investors to get an overall sense of the company’s cash inflows and outflows and obtain a general understanding of its overall performance. Perform an analysis of a cash flow statement in CFI’s Financial Analysis Fundamentals Course. Below is a helpful video explanation of what the statement of cash flows is, how it works, and why it’s important. Check out the video and you’ll learn a lot in just a few minutes! Thank you for reading this guide to better understand how companies generate and use cash in their businesses. We hope you understand how cash flow is different than profit, and how to more thoroughly analyze financial statementsAnalysis of Financial StatementsHow to perform Analysis of Financial Statements. This guide will teach you to perform financial statement analysis of the income statement, balance sheet, and cash flow statement including margins, ratios, growth, liquiditiy, leverage, rates of return and profitability. See examples and step-by-step instruction.